Covered with beautifully tactile faux crocodile leather, the Crocodile Brown helmet is hand finished with elegant stitching along the fabric to create a seriously luxe effect. This helmet is one of the most popular designs from Sawako Furuno as the brown colour is very versatile and works nicely with whatever you're wearing. One size fits all - the dial-to-fit size adjuster fits most head sizes (52-58cm). Complies with European helmet standard CE EN1078NZ which is an approved standard for New Zealand. These helmets have 11 vents to both keep your head cool, but also keep your head warmer in cooler conditions. Featuring a bold flower design on a vibrant red background the Hanabi Red is one of the new 2015 designs from Sawako Furuno. Great for visibility in the morning rush our, the Hanabi Red's exuberant design is both lovely to look at and stunning to wear. One size fits all - the dial-to-fit size adjuster fits most head sizes (52-58cm). Complies with European helmet standard CE EN1078 which is an approved standard for New Zealand. These helmets have 11 vents to both keep your head cool, but also keep your head warmer in cooler conditions. One size fits all - the dial-to-fit size adjuster fits most head sizes (52-58cm).Complies with European helmet standard CE EN1078 which is an approved standard for New Zealand.These helmets have 11 vents to both keep your head cool, but also keep your head warmer in cooler conditions. One size fits all - the dial-to-fit size adjuster fits most head sizes (52-58cm). Complies with European helmet standard CE EN1078 which is an approved standard for New Zealand. These helmets have 11 vents to both keep your head cool, but also keep your head warmer in cooler conditions. Floral is simply stunningly beautiful. It’s inspired by the founder’s own vintage floral dress. Fans of Erdem, Liberty London or even Laura Ashley will feel at home with this elegant & very pleasing design. Versatile enough to work with a number of looks, but with personality to stand out in the morning bike lane rush this is a helmet to be admired, on and off the bike. One size fits all - the dial-to-fit size adjuster fits most head sizes (52-58cm). Complies New Zealand safety standard AS/NZS 2063-2008. These helmets have 11 vents to both keep your head cool, but also keep your head warmer in cooler conditions. This 100% cotton T-shirt is designed to provide all out comfort and convenience for slick city riders and country cruisers alike. On the back of the T-Shirt, this unique HJUL print is made with reflective ink. Ready to grab-and-go, this versatile, snug-fit sweatshirt is made of durable 100% cotton. It features both a front chest pocket and hidden zippered side pocket to put your small stuff in. On the sleeve cuffs you’ll find easy access thumb holes that allow you use the cuff to cover your fist, which is especially nice on those cold rides. With safety in mind, we’ve added a low-profile, matching colour reflective patch (yes, pretty cool). It's hard work but someone's got to do it so why not let these pants do it for you? Produced in 100% cotton	this model has a reinforced crotch area. A special side seam pocket safeguards your valuables while a reflective strap decorates the back pockets as well as the inner seams with use. All you have to do to show them off is roll up the leg and find the snap buttons and you all are set to ride. Built to look and feel good both on and off your bike these uniquely durable three seasons shorts will serve you well spring, summer and fall. We’ve designed them for provide superior riding comfort by reducing chafing with a reinforced crotch and seat panel which is sweet for all day riding. Other cyclist friendly features include dual bottom closure back pockets an easy access side pocket with a concealed zipper closure (perfect for your smart phone) and a small hidden waistband pocket. An additional backside hip reflective patch gives you both added safety and street cred. This urban multifunctional look made in 100% nylon material features a corduroy collar and matching hems. Usable as the inner lining of its Waxed Cotton brother this quilted model similarly incorporates an inverted box pleat on the back that splits open to reveal a reflective material insert when you hunch over to grab your handlebar. The Hjul workwear jacket has the cool months in mind. Made from high quality rough-hewn denim, this sure to be favourite melds durability and good looks that got you covered well. While it’s obvious you’ll dig the corduroy collar and elbow patches the real magic lies on the super functionality. 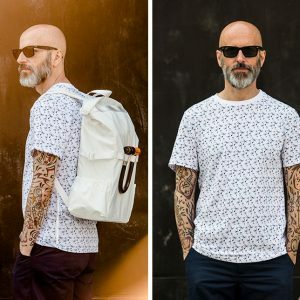 Let’s run it down: armpit eyelet vents for a bit of cooling inside and outside breast pocket, spacious lower front pockets and dual inside/outside (Velcro/reflective zipper) access lower tail pocket big enough for your iPad. Nice eh? If you need a jacket that has got it all this is the one for you. Made from 100% waxed cotton this workwear style model is windproof, waterproof and sports a removable hood. The reinforced elbow patches and the internal corduroy collar come in the same colour as the body of the jacket. When you hunch over to grab your handlebar an inverted box pleat on the back splits open to reveal a reflective material insert that will give you the power to fight the dark streets and fear them no more. 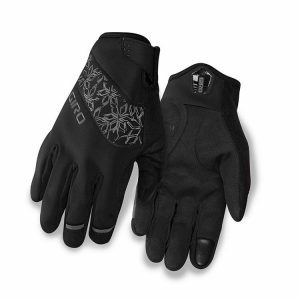 A winter glove that's tailor-made for cold, windy conditions and rides where dry hands are essential. 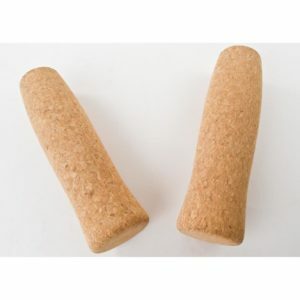 Just like on an old fishing pole, these are natural cork grips. Cork grips absorb shock and don't get slippery. They are nicely shaped to fit your hand and very comfortable. Perfect for your city bike or classy mountain bike. They also look great with shellac! Black grips made of black rubbery foam mixed with cork. If these or any grips fit too loosely on your bars, put a bit of tape on the bar first. Any tape will do, electrical, duct, athletic, Tressostar. Fits standard 22.2mm (grip area) bars only. Price is per pair. 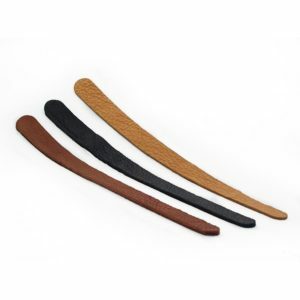 These are soft leather with a self-adhesive double-stick tape on the back. They match our elkhide sewn-on handlebar covers and toe clip leathers. They protect your paint from chain slap and give your bike a finished look. In decades past, constructeurs actually brazed on fittings over which a leather strip was stretched. Our elkhide strips are the next best thing. Like all of our elkhide leather goods, they are cut by hand in the US. 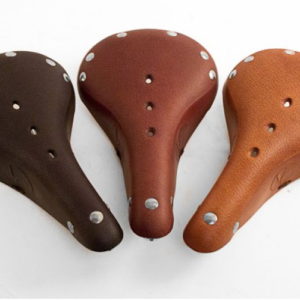 Velo Orange saddles are made of the finest Australian cowhide. The frames are sturdy chrome plated steel. The midsection of the aprons are tied together underneath so the saddle won’t play out over time. The rivets are chrome plated and the edge of the skirt is skived. 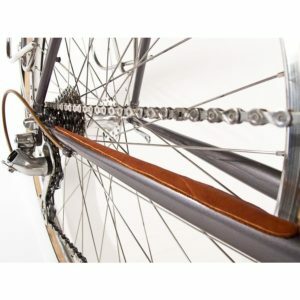 The rails are about 10mm longer than on Brooks saddles. 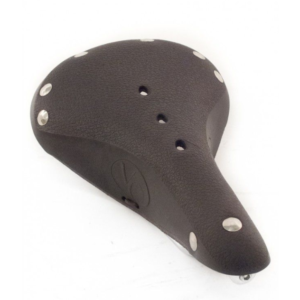 The Model 3 saddle is 170mm wide and 285mm in length. 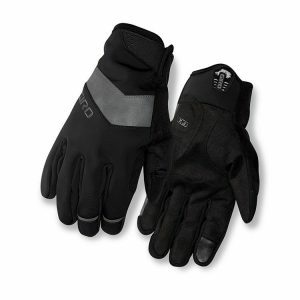 This is a size that most will find ideal for long distance touring and casual riding. It is particularly appropriate if your handlebars bars are set at, or above saddle height. Weight: 665g.